UHF or VHF All Solid-State Stereo (Zweiton or Nicam Available) TV transmitter (power variety from 10Watt to 600Watt peak sync.) 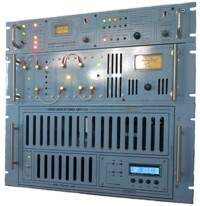 is convenient to upgrade to digital TV signal transmitter, with all solid-state circuit design and combined amplification of video/audio carrier, and provide dual high quality TV exciters (composed by Stereo TV IF Modulator and IFCU/V - TV Up converter) for optional demands, which can guarantee the reliability and stability while TV signal is transmitting. • With all-solid-state circuit design and combined transmission of video/audio carrier, convenient to upgrade to digital TV signal transmitter. • With High Quality TV exciters (composed by Stereo TV IF Modulator and IFCU/V - TV Up converter) are able to guarantee the reliability and stability of TV signal transmission. • Advanced RF non-linear pre-correction technology is able to make the whole equipment work under super-linear state and low the RF distortion. • With super-linearity broadband amplifier unit and modularized design power amplifier, and adopted LDMOS high-power FET, this device has great redundancy and easy to install and maintenance. • With over-voltage, over-current, over-heat, over-excitation, low-voltage, short-circuit and over-VSWR auto-protective functions, it could run securely. • Wide voltage stability range and high efficiency, Linear system power supply. • Forced-air-cooling design with low power consumption and low noise. • High-quality. The video quality of IF Modulator represents the right step just before the DTV generation. Using a new back-porch clamping circuit, combined with linearity corrector it’s possible to obtain a perfect video quality with negligible distortions and intermodulations. All this means a superior video modulation quality. • Compatible with all TV standards. These IF Modulator is fully compatible with all video standards (PAL, NTSC, SECAM) and is available for B,G,M,N,I,D,K,K1 and L modulation systems. These professional multi standard TV IF Modulator is designed to produce sound and vision modulated signals at any standard intermediate frequency. • Vestigial sideband SAW filter. For a perfect vestigial sideband modulation an high quality SAW filter is used complying with all international standards. These filters outstand for their excellent phase linearity and flat pass-band and group-delay characteristics. • Group delay pre-correction. TV receiver group delay pre-correction is available for all standards (optional). • White clipper & Video Emphasized. 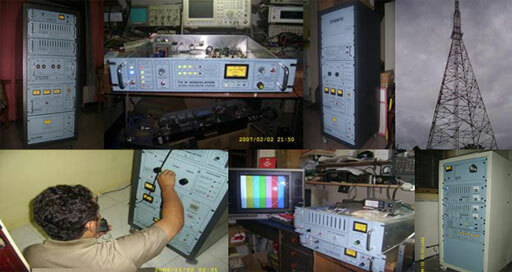 The white clipper & Video Emphasized have been setting up to guarantee the best modulation quality. • Sync restore. An internal sync restore circuit (optional) allows to ripristinate a perfect video sync pulse also with corrupted or scrambled video signal input. • PLL sound carrier. Sound and video intercarrier is synchronized by PLL to video line frequency for maximum stability and negligible intermodulations. • Stereo and dual sound. Available with Stereo and/or dual sound facility (Zweiton or Optional Nicam-Digital) for stereo or dual sound transmissions. • Panel metering. Full front panel metering (LCD micro controller) and control for complete setting and performance checking. • Remotely Audio Mode synchronization (Optional). Input for external Audio Mode synchronization is available for Audio Mode system (Stereo/Dual/Mono). - Differential Phase : +/- 3 Deg.